The University of Miami College of Arts and Sciences brought about 100 students, faculty, local religious leaders and scholars, and history buffs together to hear Mark Noll, the Francis A. McAnaney Professor of History at the University of Notre Dame and the nation’s leading scholar of religious history, discuss the Bible’s important impact on the Civil War. Noll’s lecture included three sections. “Controversy” addressed the role of religion in the pre-war period, including the use of Biblical passages to justify slavery. In the “Combatants” section, he spoke about the soldiers’ study of Bible passages during their combat experiences, including reading many letters that included quotations from the scriptures. “Consequences” focused on the time after the war, and especially the disputed 1876 Presidential election between Rutherford Hayes and Samuel Tilden. 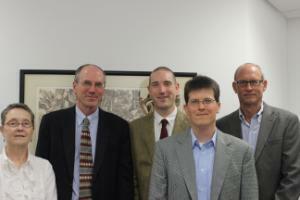 The lecture, part of the Department of History Speaker Series, was co-sponsored by the Department of Religious Studies. Professor Noll’s research focuses on the history of Christianity in the United States and Canada. He has authored more than two dozen books on religion and politics, the evolving view of God in America, and how the American experience reflects Christianity across the world. Noll’s 2002 book America’s God: From Jonathan Edwards to Abraham Lincoln is widely viewed as the authoritative text on the role of religion in America during the antebellum period. Professor Noll is a member of the American Academy of Arts and Sciences, He received the National Endowment for the Humanities medal in 2006. He earned his Ph.D. in the History of Christianity from Vanderbilt University, M.A. degrees from the University of Iowa and Trinity Evangelical Divinity School, and a B.A. from Wheaton College, Illinois. He served on the faculty at Wheaton, where he co-founded and directed the Institute for the Study of American Evangelicals, for 27 years before moving to Notre Dame in 2006. Each year, the Department of History's Speaker Series brings several of the world’s leading historians to campus to share their work with members of the UM community and the broader public. This year’s series covers a diverse range of topics, including the Haitian Revolution, the Bible in the American Civil War, and the global history of marijuana. For more information on the Department of History, UM College of Arts & Sciences, please visit www.as.miami.edu/history/. For more information on the Department of Religious Studies, UM College of Arts & Sciences, please visit www.as.miami.edu/religion/.